'M 'N g (hex FB) evolves into PkMn PkMn T at level 18, so it does in fact have a pre-evolution. 'M 'N g doesn't have its own page yet, but it seems to be a hybrid of Onix, with a sprite identical to ◣ゥ_8 (which is also a hybrid of Onix). Only it has a blank cry, unlike ◣ゥ_8's slo-mo Champion battle treble. It knows Tackle and Screech at start, but learns TM50 at lvl 15, Hypnosis at lvl 17 and TM01 at lvl 18 (which is when it evolves). 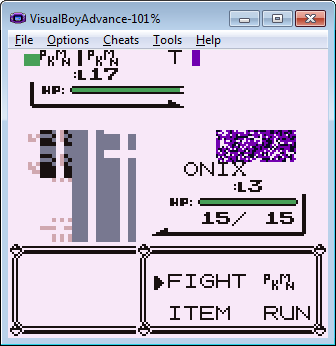 Perhaps it is an emulator error, but VBA shows the sprite as purple. This page was last edited on 5 April 2018, at 20:15.